ITINERANT peace activist Graeme Dunstan launched a pre-emptive strike for peace in Rockhampton yesterday. He staged a public speak-out at the Western St Barracks from 11am, giving locals a chance to express their concerns of what he calls the toxic consequences of the US-Australia alliance. While Americans celebrated Independence Day, Mr Dunstan said July 4 in Australia should be recognised as Independence from the USA Day. "Unquestioning subservience to the US military alliance by the major political parties, the bureaucracy and the military has delivered Australians 13 years of costly, bloody and futile war," he said. "Forty-two Australian soldiers dead, over 200 maimed, as yet unknown thousands permanently afflicted with PTSD and a cost to taxpayers of in excess of $31 billion and for what? 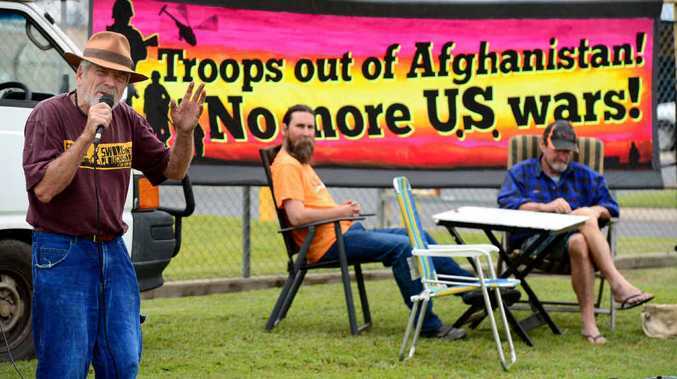 Protest outside Rockhampton Army Barracks: Graeme Dunstan holding a protest outside the Rockhampton army barracks. "Can anyone point to anything enduringly good that has come from this squandered treasure and wasted blood?" Mr Dunstan said it was time to ask the questions that the party politicians were afraid to ask. "It's time to separate the interests of the US empire from the long-term interests of Australians," he said. "It's time to speak up."